Science has always strived for objectivity, for a “view from nowhere” that is not marred by ideology or personal preferences. That is a lofty ideal toward which perhaps it makes sense to strive, but it is hardly the reality. 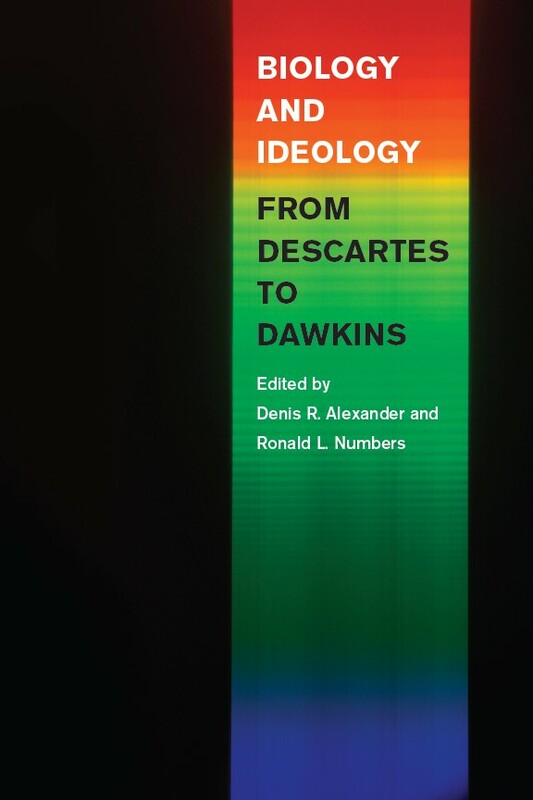 This collection of thirteen essays assembled by Denis R. Alexander and Ronald L. Numbers ought to give much pause to scientists and the public at large, though historians, sociologists and philosophers of science will hardly be surprised by the material covered here. As a matter of historical record, the sciences have always been involved in ideological disputes, sometimes battling against anti-scientific ideologies (as with today’s creationism) or being used for nefarious ideological purposes themselves (as with the infamous episode of eugenics in early 20th century America). Peter Harrison, in his essay on the cultural authority of natural history in early modern Europe, makes the point very clearly that advocates of the emerging sciences defended their novel, anti-Aristotelian approach in part on the basis that it was more conducive to a traditional humanistic education. For instance, insect metamorphosis was interpreted as analogical to the Christian belief of a resurrection of the body after death. And the ideological entanglement wasn’t only with religion, but extended to politics as well. As Harrison points out, Milton declared that the organization of ant colonies was a naturalistic sanction of parliamentary democracy! Of course, that game can be played by both sides, so it is not surprising that later in the same century the Whig John Edwards — who supported the monarchy of William and Mary — used bee colonies as indicative of the goodness of female monarchy (it is not clear where one could find William’s alter ego among bees, but never mind the details). Eugenics is, of course, the historian and philosopher of science’s favorite whipping boy when it comes to warning about the perils of entanglement between science and ideology. It is therefore no surprise to see here a contribution by Edward Larson on biology and the emergence of the Anglo-American eugenics movement. What is surprising is to be reminded of both the damage perpetrated and the high level of endorsements gathered by the eugenic movement in the UK and the United States. I wonder how many contemporary biologists realize, for instance, that the 1933 Nazi Law for the Prevention of Genetically Diseased Progeny was modeled on a eugenic law that forced sterilization of the feeble minded passed in California. Or that eugenic statutes remained on the book in the United States until the 1960s, by which time more than 63,000 Americans had been forcibly sterilized. And the list of prominent biologists endorsing and sometimes vociferously defending eugenics reads like a who’s who of early 20th century biology. It includes August Weismann, Karl Pearson, William Bateson, Hugo de Vries, Thomas Hunt Morgan, Ronald Fisher, J.B.S. Haldane, and Sewall Wright, among others. It that doesn’t shake your confidence in scientists’ ideological neutrality I don’t know what will. Of course, politicians promptly followed suite, with Presidents Theodore Roosevelt, Woodrow Wilson, and Calvin Coolidge all endorsing eugenic measures. Michael Ruse, whose writings seem to appear in every noteworthy collection of philosophical essays, contributed a provocative entry on evolution and the idea of social progress. These days it is highly unfashionable among evolutionary biologists to talk about progress, except in the factually obvious sense that the biosphere has become more complicated through time (which Stephen Gould famously attributed to a simple “left wall” effect: if you start simple, the only way you can possible go is toward complex). But it wasn’t like that until relatively recently. After Darwin (and Wallace) cleared things up and made evolution a respectable scientific concept, the situation became interesting again during the early 20th century, when a number of biologists were working to come up with what is now known as the Modern Synthesis, the standard model of evolutionary biology. A strange thing happened, following Ruse’s reconstruction of the thinking and writing of the architects of the Synthesis. On the one hand, pretty much all of them were ardent believers in the idea of progress: Fisher thought that God had created organisms progressively through natural selection (a line of thinking that led him to support the eugenic movement, to avoid the decline of the human race); Dobzhansky was an enthusiastic supporter of the idea of progress (again informed by his religious beliefs); and Ruse describes Simpson as “fanatic” about both biological and cultural progress. On the other hand, none of this shows up in any of these people’s technical writings: it’s all confined to their essays for the general public. Moreover, the only architect of the Synthesis that did incorporate the notion of progress in his technical book, Julian Huxley, was shunned, harshly criticized, and penalized in terms of his scientific career (grants denied, negation of the editorship of a new journal on evolution). What was going on? As Ruse provocatively puts it: “They had all taken in the message that successful science, mature science, epistemic science, professional science, is culture-value free,” which means that they couldn’t risk injecting what they must at some level have perceived as ideology — their belief in progress — into their science, at least not in front of their peers. But it was okay to wax poetic about progress with the general public, thereby indirectly giving the impression that progress and evolutionary biology went hand in hand. It sounds a lot like the increasingly annoying tendency of some contemporary physicists to write about the compatibility of science and religion, and sometimes even more or less explicitly endorse some version of intelligent design (usually in the guise of the anthropic principle) — in their non-technical writings only, of course. As a bonus, contemporary scientists can have a shot at the hefty Templeton Prize, which was not established when Dobzhansky, Simpson and Fisher were writing. The message of the Alexander-Numbers book should be loud and clear: science has always been, and very likely always will be, entangled with ideology. This is because science, as Helen Longino put it in her Science as Social Knowledge, science is an irreducibly social activity, and as such it reflects the many, not always positive, ways in which people interact. Science of course is also a pursuit of knowledge, and knowledge is power, according to Francis Bacon, and therefore not too far removed from politics and ideology. Actually, that famous Baconian phrase happens to fit very well with this discussion, as the original sentence, in Latin, was “scientia potestas est” (found in the Meditations, 1597). Problem is, Bacon wrote that within the context of a discussion of heresies denying the power of God, so that some commentators actually think that it should be translated as “knowledge is His power.” Science and religion, deeply entangled right in the writings of the man who is credited for having laid out the basis of the modern scientific method by rejecting the Aristotelian approach. Anything in that tome re Samuel Butler's contribution? Massimo: I've often heard/read about how modern science broke with Aristotelian cosmology and teleology, but can you be more specific about what you mean above by an "anti-Aristotelian approach"? The Supreme Court even ruled that Virginia, I think was the state, had the constitutional right to sterilize "imbeciles," etc. Re Ruse: Even Darwin himself skirted edges at times. Hofstadter has a quote from him in "Social Darwinism in American Thought," where he lauds evolution culminating in the Anglo-Saxon race's rise to fruition, ultimately in America. by anti-Aristotelian approach the author meant a rejection of Aristotle's approach to science and the embracing of the type of inducting approach that Bacon eventually codified in his New Organon (the title of which is a response to Aristotle's Organon). caro M, you quote and write: (Ruse)“They had all taken in the message that successful science, mature science, epistemic science, professional science, is culture-value free,” (you)which means that they couldn’t risk injecting what they must at some level have perceived as ideology — their belief in progress — into their science.." a statment that likely has demoted you the minors in the leagues of many scientists whom refuse to consider the view that value free science is a non sequitur. Havent neodarwinists (the subset of new(gnu)atheists ) and supporting cast of fans declared the triumph of science (over what not clear) (knowledge, but not the same), the pacification of the world(pinker) and declared neocapitalism (everything neo) the apex of cultural evolution?